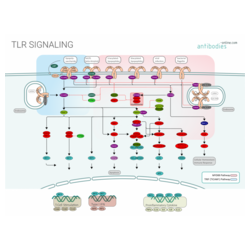 As part of the innate immune system the Toll-like receptor (TLR) signaling pathway contributes to the first line of defense against microbial pathogens. The innate immune system was historically considered nonspecific in response to different invading pathogens, targeting a wide array of pathogenic organisms, including viruses, bacteria, and fungi. This paradigm substantially shifted with the discovery of the Toll receptor in Drosophila. To date, 10 members of the family have been identified in human and 13 in mouse. Homologs have also been discovered in plants, illustrating the high-degree of conservation in this receptor class. Different TLRs recognize specific pathogen-associated molecular patterns (PAMPs). The chemical nature of these PAMPs is highly diverse; e.g. lipopolysaccharide (LPS) of gram-negative bacteria are recognized by TLR4 while TLR5 recognizes the bacterial protein flagellin. Ligands for TLR3, 7, 8, and 9 are nucleic acids, and TLR2 is specific for lipoproteins. Binding of a TLR ligand to the N-terminal ectodomain of a TLR prompts the formation of TLR homo- or heterodimers. Following dimerization, TLR signals are transduced via a cytoplasmic C-terminal Toll IL-1 receptor (TIR) domain to a set of adapter proteins. Downstream, TLR signaling engages two distinct pathways in which either TRIF (TICAM2) or MyD88 are the key component. 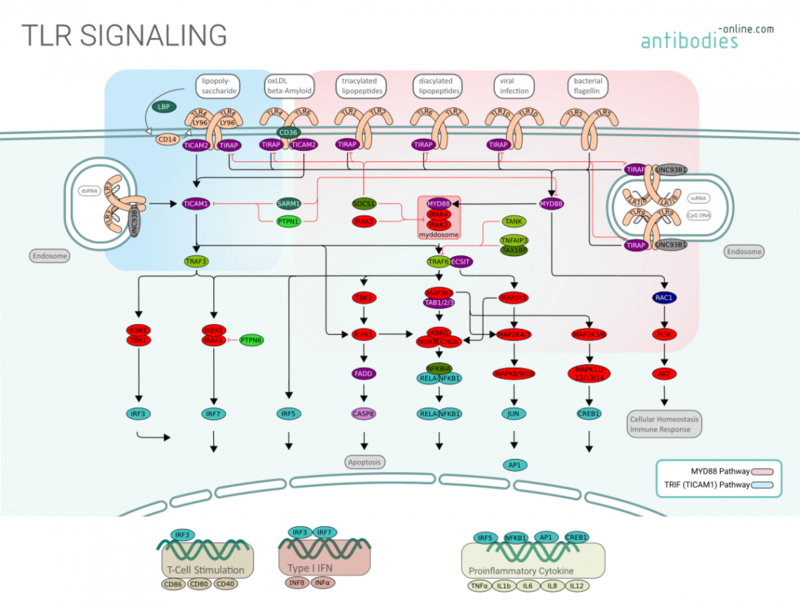 Both pathways culminate in the induction of inflammatory cytokines (TNF, IL-6, IL-12), type I interferons (IFN-alpha, IFN-beta), or apoptosis. Furthermore, TLR signaling induces dendritic cell maturation and contributes consequently to the adaptive immune response.